It’s no secret that cigar smoking has become a thing with celebrities from Kanye West to Leonardo DiCaprio and Daniel Craig among its fans. Their love of the stogie leads them to purchase super expensive humidors and to build cigar collections sourced worldwide. Will they make travel plans based on their hobby? You betcha. At least that is what the Hotel Vier Jahreszeiten Kempinski Munich is banking on. The luxurious property with 160 years of history behind it has just opened a fancy cigar lounge that it hopes will attract both local and international cigar lovers. Designed by interior designer Colin Finnegan, the space taps into a gentleman’s club aesthetic with leather armchairs sitting in front of a Louis XVI fireplace. 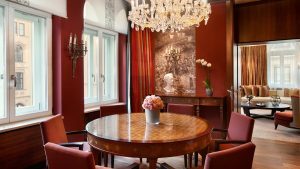 Regular guests can have their own private humidors—with a minimum yearly rental fee of 3,000 Euros—for storing their favorite puffs. Those puffs will come courtesy of cigar partner Max Zechbauer, Munich’s most esteemed supplier of cigars and the oldest cigar shop in Germany. 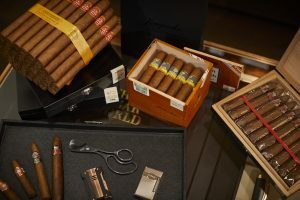 It carries more than 450 selections from prestigious names like Davidoff, Cohiba, Arturo Fuente and Daniel Marshall 24 Karat Gold Cigars, plus other rarities. The lounge is an exclusive space with room for just 20 smokers. The good news for them is that it is accessible around the clock to accommodate their puffing needs. 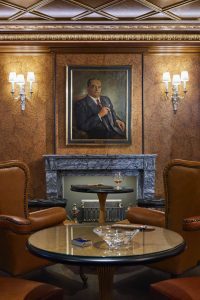 The Kempinski Munich is less than a minute from the original Zechbauer München cigar shop, the exclusive supplier to the Royal Bavarian court and 14 other royal courts across Europe. If you’re would-be royalty, you may want to book the Kempinski’s posh Ludwig Suite, complete with Jacuzzi, two bedrooms, leather floors, living room, dining room and private kitchen. Its 24/7 butler service will come in handy when you want someone to go fetch your cigars and you’re too busy having a steam in your in-room sauna.